Vine Trail FAQs: Know Before You Go! *There are two stretches of Class II bike lanes where the Vine Trail has not yet been constructed: 1) 0.3 miles along Solano Ave. from the north end of the Park & Ride Lot across from the Napa Valley Marriott to just south of the Chablis Inn and 2) approximately a half-mile along Socsol Ave. between Vallejo and Third Streets. View detail on the map below. That sounds cool! How can we ride it?! Our two shop locations in Downtown Napa and Yountville (see map below) offer nearly instant access to the Napa Valley Vine Trail. You can rent bikes from either location to ride the Vine Trail. Can we rent bikes in Downtown Napa & return them in Yountville (or vice versa)? YES! Please note that for all point-to-point rentals there is a 2-hr minimum rental charge, plus a $10 per bike relocation fee. If you ride point-to-point, your options for getting back to your starting point are calling a taxi or Uber/Lyft. Can we visit wineries along the Napa Valley Vine Trail? The short answer is: not without exiting the Vine Trail and riding along some local roads. There is a small handful of wineries located within a stone’s throw of Vine Trail; however, you cannot reach these wineries without exiting the bike path and riding on roads where you will be riding alongside traffic. Check out the map below to see some of the wineries and tasting rooms located within one mile of the Vine Trail. If visiting wineries is the primary goal of your bike ride, you should not expect to confine your ride to the Vine Trail. The vast majority of Napa Valley’s wineries are located along Hwy. 29 and Silverado Trail. Both of these roads have a bike lane or wide shoulder. Click here to learn more about the bicycling infrastructure of these roads. 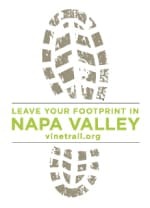 When will the rest of the Napa Valley Vine Trail open? *Cyclists who are unwilling to slow down in courtesy to other trail users do not belong on the Vine Trail. Cyclists who desire a fast ride free of obstructions should use Solano Ave., which runs parallel to the Vine Trail and has its own Class II bike lane. The map provided here (best viewed from a full-size computer) illustrates the wineries, tasting rooms, restaurants and popular attractions that are along – or within about a mile or so of – the Napa Valley Vine Trail. Zoom In for greater detail. Urban areas can be especially hazardous for bicyclists. We HIGHLY recommend parking your bike and walking to visit destinations along Washington Street in Yountville and in Downtown Napa. Bike locks included with rental. DESCRIPTION: With more than a dozen tasting rooms, myriad boutique shops, a curated Art Walk and world-class restaurants tucked within its 1.5-mile length, Yountville easily merits an afternoon of dedicated exploration. Starting from our Downtown Napa rental shop, you’ll cruise upvalley along the Vine Trail as it parallels the Wine Train tracks. Your ride will begin with an urban adventure through the City of Napa; plan time to stop and admire and take photos with the engaging Rail Arts District (aka RAD) Murals. As you continue to ride north, you’ll reach the Oak Knoll District where the urban landscape will transform to vineyard views and the Vine Trail will wind under towering oak and eucalyptus trees with the majestic Mayacamas Range framing your eastward view. Venture off the Vine Trail to stop off and visit a local winery along the way (Laird Family Estate, Trefethen Family Vineyards, Andretti Winery, Monticello Vineyards and Domaine Chandon all welcome walk-ins for parties of 5 or fewer guests. Or make a beeline to Yountville and plan a decadent lunch at a local restaurant (R+D Kitchen, Redd Wood or Bottega, to name a few of our favorites), or pick up picnic provisions (Yountville Deli, Bouchon Bakery, among others) and make your way to Yountville Park to enjoy an alfresco feast. DON’T MISS: The French Laundry Culinary Garden really is a must-see for gardening enthusiasts and fine-dining aficionados alike! Visitors are welcome to walk along the grass pathways that run between more than 50 garden plots. Insider’s tip: Avoid the congestion along Washington Street and gain entry to the garden through the “back door” by riding the Vine Trail north through Yountville and exiting at Webber Ave. DESCRIPTION: No doubt, Oxbow Public Market is on the must-do list for many Napa Valley visitors – for good (and tasty!) reasons. An eclectic mix of more than 20 independent merchants specialize in a full spectrum of culinary specialties: Hog Island Oyster Depot, Three Twins Organic Ice Cream, Model Bakery and Gott’s Roadside are just a few of the popular outposts you’ll find at Oxbow. Communal seating areas, including a spacious outdoor deck overlooking the Napa River, allow everyone in your party to order something uniquely suited to their tastes before regrouping so you can all nosh together. DISTANCE: From Yountville, it’s ~9.5-mile ride to Oxbow Market and then 0.5 miles to return bikes at our Downtown Napa shop* or ~19 miles total roundtrip (return to Yountville). From our Napa shop location, it’s just a 0.5-mile ride to Oxbow Market, but it’s easy to extend your ride with a venture farther south through Kennedy Park. DON’T MISS: Stop and take photos with the Rail Arts District murals on your way into Downtown. Also, be sure to visit St. Clair Brown Winery, a unique urban oasis that is part-winery and part micro-brewery with a menu of small plates featuring produce from their onsite culinary garden. Ride the Whole Darn Thing! START FROM: Yountville Shop, 6500 Washington St. DESCRIPTION: For those who want to leave no mile of the Napa Valley Vine Trail unturned – or unridden, in this case – head to Yountville to start your ride from the northernmost section of the trail. From Yountville, you can ride the full length of the Vine Trail south through the City of Napa and Kennedy Park totaling 12.5 miles. DISTANCE: From Kennedy Park, you can retrace your tread marks part way to finish at our Napa shop* for a total of ~18 miles; or, ride the entire way back to Yountville for a grand total of ~25 miles.